Choosing for a trip is always hard work. Whether it be a weekend break or a few months on the road, being half prepared will make sure that you can enjoy your trip more. In this 5 step guide Uncensoredtravel will bestow the knowledge of preparing with you. Step by step we will show you the ways of the traveller, for you to further master the art of travel. The first question to ask is: How long will I be going? Are you going for a weekend break, are you going for a few weeks or maybe a big trip backpacking through a whole continent for longer than a month. Make sure you know the time frame you have to spend. The second and most important one, Which location will I visit? Are you going for a city trip or backbacking through a country? Make sure you pick a location fitting to your timeframe. Third question would be, How am I going? Are you going to use public transport, flight, car, cruiseship, on foot, or whatever your choice will be. This also affects the first question, because you want to know how much time you are spending on the actual travelling. Keeping in mind the time to go to an airport, the travel time itself and the transport between destinations. If you go with a tour company, you mostly got a schedule to go with. Some people prefer this kind of travel, but we personally find it more challenging to arrange everything yourself! Who will I be going with? Is a legit fourth question. If you are going with your grandparents changes are that you will be totally travelling different than going solo or with a friend (unless your grandparents are in better shape than you! ;-) ). You have to take account of maybe travelling with a hop-on hop-off bus in a city instead of going on foot. After you narrowed down these four questions, you are ready for the next step: planning. City trip to Copenhagen: in 2016 we decided to visit Copenhagen for 24 hours. What we did is narrowing down the must sees for us on that short period of time. What did we really want to see? The mermaid statue and Nyhavn were a must! What did we want to experience? Walking through Christiania! Roadtrip through China: in 2017 we visited several places in China. We planned our train tickets accordingly to our must sees. From Chengdu to see panda's, Leshan to see the Giant Buddha, roaming around the Terracotta Army to seeing the Great Wall of China. We did it all! Because we had a limited timeframe of 2 weeks, we really had to schedule and travel a lot with the use of public transport to see all the sights we wanted to check off our list. You don't visit China that regulary if you live in Europe! It is all about your bucket list! Know before you go! Even if you go on a city trip just for the sake of visiting something new, explore a bit online before you go to make the most out of your visit. Sure, you can visit a tour agency to do all the work for you. But preparing is half the fun as well! It makes you excited for things to come. Gather information from social media like Pinterest, Instagram, Google images and Facebook groups. Be part of travel related Facebook groups to gain intel and gather it for your own adventures. But also use your best friend: Google. Just Googling "top 5/10/20/... things to do in INSERT CITY/COUNTRY NAME HERE" gives you links towards Tripadvisor (not our favorite), blogs (very helpful! Just like this one :-) ) and official websites of sights in that area. Maybe you know someone local in your own network, connect to get some great insider tips! Make sure you know beforehand what you want to do. Especially if you want to visit something which is a tourist attraction, like the Burj Khalifa in Dubai, when it could come in handy if you already purchase a ticket online so you have a guarenteed entrance and will not be refused entrance. You straight away know your costs as well! Also check for your overnight stay. Useful websites like Booking or Trivago are great, but do not forget platforms like a couchsurfing! Okay, now the real planning commenses. 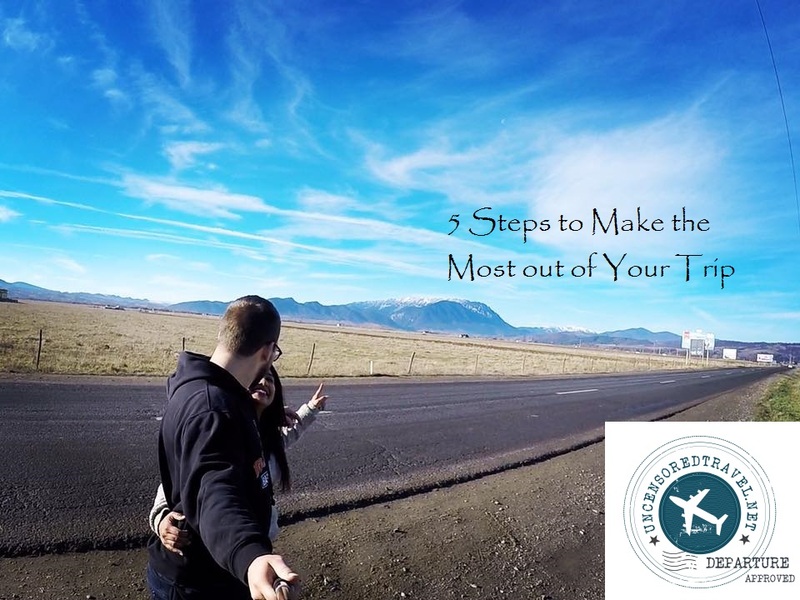 You just made a list of must visits during your stay, gained insight about how to go from A to B, what there is to see/do, where to stay and how much things could cost. If you are on a tight schedule, this is a good way of working. You plan your must sees day by day and the other time you just explore! If you backpack, you just decide which places are a must visit for your first idea. Of course a place could be very appealing to stay longer or you could be very bored quick and want to move on while visiting the sight. That is part of travelling! Just plan your must do's, make up your costs, book the essentials and off you go! Explore, experience, enjoy. The 3 big E's of travelling! Explore the city/country you are visiting using your intel but also experiencing yourself during your stay! Perhaps you find out of a special museum or activity which is open during your stay you learn about from brochures at your hotel. Maybe you meet a local and they show you around and give you some insider tips. It is all possible! The best thing to do is, enjoy. Life is too short not to do that anyways! As you see in the gallery below, I surely enjoy all the beautiful things this planet and our history has to offer :-), hope you do the same!